For most people, holidays are a time for celebration and quality time with family and friends. While alcohol is usually present during these occasions and consumed more than on an average day, the tradition to drink can make holidays more triggering than joyous for those in recovery. Although Americans seem to find a reason to drink for every holiday (even the candy-centered Halloween), certain celebratory events are boozier than the rest. So which holiday has people drinking the most? 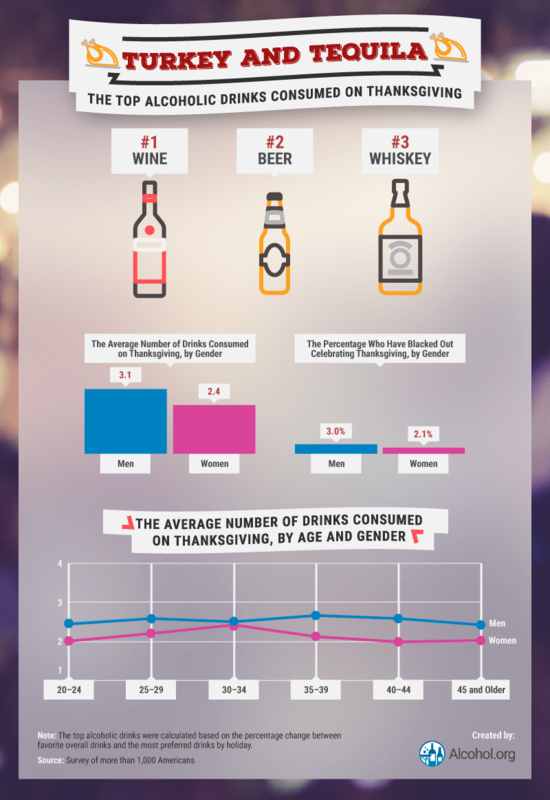 We surveyed over 1,000 Americans about their drinking consumption during these festive occasions to find out. Keep reading to see which holiday may be the hardest concerning temptation. The people of New Orleans gather to throw one of the biggest parties of the year, celebrating the last day before Lent begins the season of fasting and abstaining from certain indulgences. Mardi Gras may bring in the beads, but it also brings in the booze. On average, Americans consumed 4.5 drinks on this day, making “Fat Tuesday” the booziest of the bunch. 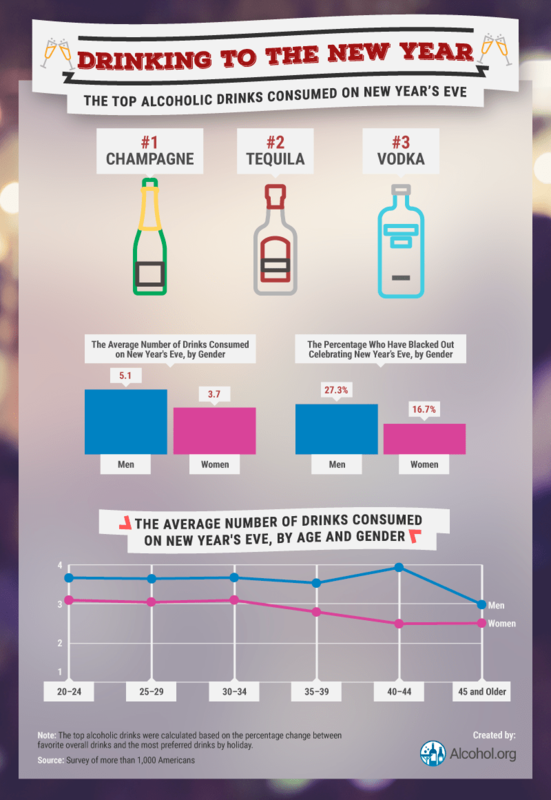 New Year’s Eve wasn’t too far behind with an average of 4.4 drinks consumed. With both of these holidays being the last day before either fasting or following a resolution, Americans may be more inclined to overindulge as a way of preparing to give something up. St. Patrick’s Day may have been third on the list for the most consumed drinks, but it’s a holiday men most associated with alcohol. Thirty-six percent of men tied St. Patrick’s Day to alcohol, while 44 percent of women thought the association was strongest with New Year’s Eve. Although the two genders disagreed on the association, New Year’s Eve was the holiday when both binge drank the most. Forty-seven percent of men and 40 percent of women admitted to binge drinking to ring in the New Year. On every holiday, though, men were more likely to binge drink than women by at least four percentage points – the biggest difference being St. Patrick’s Day when men binge drank more than women by about 46 percent. New Year’s Eve and St. Patrick’s Day were the most associated with alcohol, but the association wasn’t necessarily a positive, celebratory one. Not only does binge drinking increase the risk of numerous short- and long-term health risks, including alcoholism, but booze-infused holidays can also be the most dangerous times on the road. Depending on the holiday, people show their festivity in different ways, but one thing our study suggested was those who were more festive drank more than those who weren’t. Although the difference was slight, festive men consumed 0.8 more drinks than men who didn’t consider themselves festive. 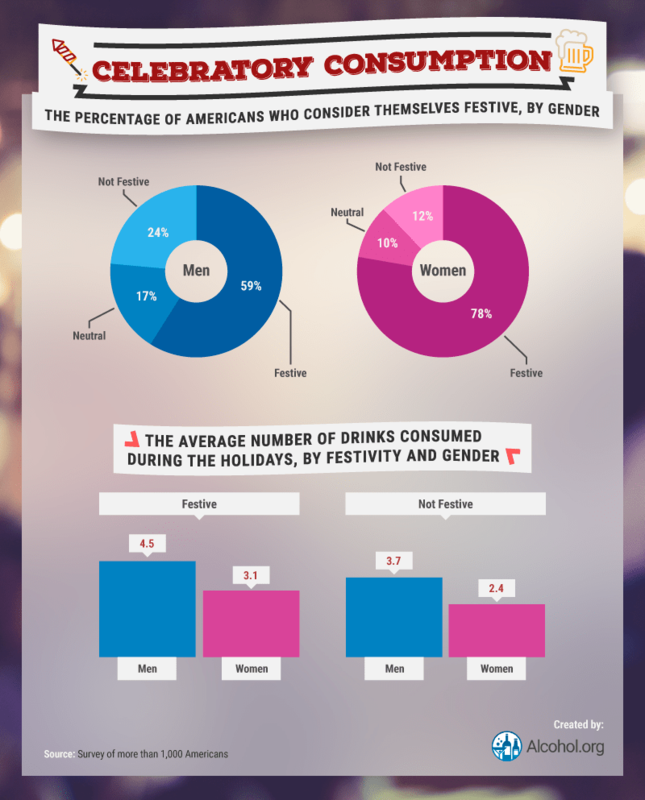 As for women, there was a 0.7 drink difference between festive and not. While these increases may seem trivial, a single drink can make all the difference in crossing an intoxication threshold. 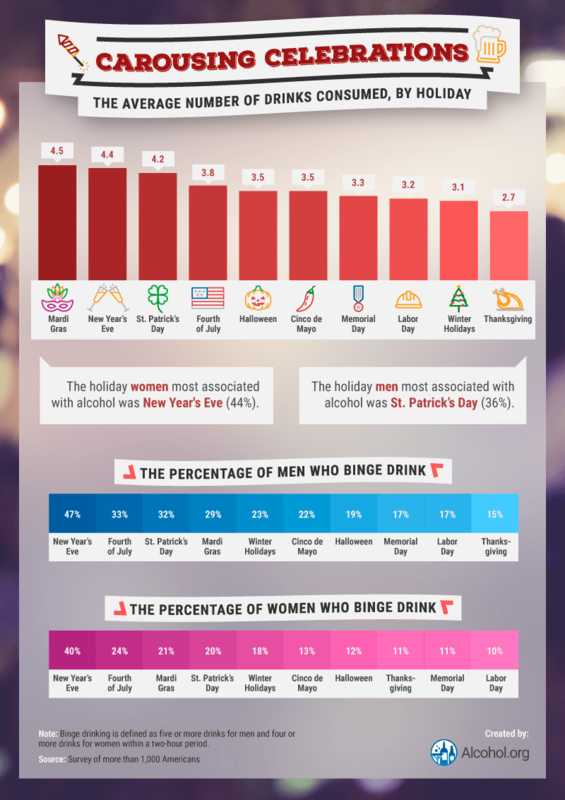 To figure out what beverage Americans preferred most on a specific holiday, we asked respondents about their favorite alcoholic beverage and their drink preference for each holiday. By taking the percentage change between those two figures, we were able to narrow down what types of drinks respondents preferred most. Dressing up and trick-or-treating for candy has been a Halloween tradition for decades, but as kids grow up, the thrill of candy collecting can fade and be replaced with a desire to drink. Men and women over the age of 20 all reported drinking an average of at least two drinks on Halloween, with men and women 20 to 24 years old drinking the most of any age group. On average, men in this group drank almost four drinks – about a full drink more than women – and were more likely to have blacked out while celebrating. What drink did costumed partiers choose? 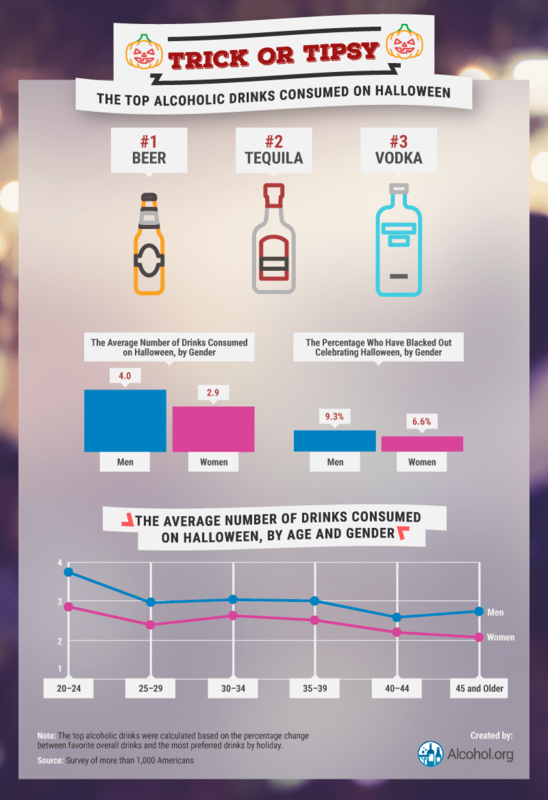 Beer was the most preferred drink for Halloween, followed by tequila and vodka. Wine was the beverage of choice for Americans during Thanksgiving, maybe because time is being spent sitting around a table of food rather than partying with the intent of getting drunk. Beer and whiskey were the next beverages consumed most often, respectively, but both men and women drank less on average compared to Halloween. Despite the possibility of family-fueled drinking, men drank an average of 3.1 drinks, while women drank an average of 2.4. A relatively low percentage of each gender blacked out while celebrating Thanksgiving – 3 percent of men and just over 2 percent of women. Hard liquor didn’t make the top three preferred drinks for the winter holidays, despite eggnog – normally made with brown liquors like rum or bourbon – being one of the most popular seasonal drinks. Champagne was the most preferred beverage, followed by wine and beer. Again, men consumed more drinks on average than women – 3.6 compared to women’s 2.7. Women in their 20s and early 30s drank around 2.5 drinks on average, but the number decreased after age 34, with women aged 40 to 44 drinking the least of all age groups. New Year’s Eve had the highest percentage of both men and women reporting a previous blackout while celebrating the beginning of a new year. A whopping 27.3 percent of men and 16.7 percent of women drank enough to have difficulty recalling their celebration. Champagne was the most preferred drink, followed by tequila and vodka – two hard liquors that can lead to blackouts more quickly than beer due to a higher alcohol content. On average, men drank 5.1 drinks, while women drank 3.7. Men aged 40 to 44 were the heaviest drinkers for this holiday, but, interestingly, women in the same age range drank the least of all age groups. Whether it’s Mardi Gras, Memorial Day, or Halloween, Americans seem to raise a glass in celebration for every holiday. But alcohol isn’t the only gateway to celebration, and for 15.1 million Americans with an alcohol use disorder, it can become a gateway to relapse. Even for those who think they don’t have an issue, binge drinking and blacking out can be a sign of a bigger problem. If you or someone you love is misusing alcohol, you’re not alone. At Alcohol.org, we’re here to help you find all of the information about the use and misuse of alcohol, from recent studies and statistical data to support groups and helplines for struggling loved ones. Visit us online today. We surveyed over 1,000 Americans about their drinking consumption during the holidays. 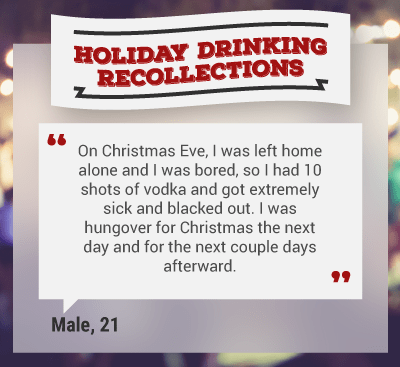 We asked them to estimate their specific alcohol consumption and recount their past experiences. Fifty-two percent of respondents identified as men, 47 percent of respondents identified as women, and less than 1 percent identified as a gender not listed by our survey. Results that examined the average number of drinks consumed excluded nondrinkers or individuals who answered they would not drink alcohol during a specific event. To determine the top alcoholic drinks by holiday, we calculated the percentage change between favorite alcoholic drinks and preferred alcoholic drinks for each holiday.